Atlanta Motor Speedway will celebrate the Fourth of July with a special Independence Day edition of the ever popular street drag racing series The O'Reilly Auto Parts Friday Night Drags with its biggest, most patriotic night of the summer on Wednesday, July 4. 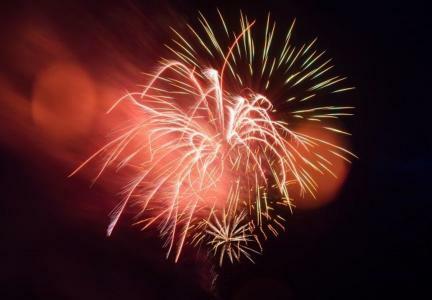 The Papa John's Pizza Fireworks Extravaganza will feature one of south metro Atlanta's largest fireworks displays of the holiday, coupled with Week 8 action on the pit lane drag strip. The affordable, family-friendly Papa John's Pizza Fireworks Extravaganza will feature a $250 cash giveaway to one lucky fan, a 50/50 raffle benefitting Speedway Children's Charities, concessions, libations, and best of all, a dazzling display of fireworks leading into some of the fastest, most popular street-style drag racing in the South. Tickets are only $10, with kids 5 and under free, and include admission for both the fireworks show and all the drag racing action. While grandstand seating offers the best view of the fireworks display, an admission ticket also affords access to the infield, where fans can get a close-up view of all the high-speed, engine-revving action along the pit lane fence. For just $20 per vehicle, fans can celebrate the Fourth of July with a parade-like cruise in their own vehicle on the historic Atlanta Motor Speedway racing surface. Show-N-Shine car show participants will have their vehicle judged in one of seven categories before rolling out onto the 1.54-mile oval in what is projected to be one of the largest speedway cruise in the history of the O'Reilly Auto Parts Friday Night Drags. Track photographers will take professional photos of each vehicle participating in the Show-N-Shine speedway cruise, and full-color high-definition prints will be available to purchase through vizionz.boydnetonline.com. The summer drag racing series will not run on its usual Friday night slot this week, instead opting to race on Wednesday as part of the July 4th holiday festivities. Gates for both spectators and Show-N-Shine participants open at 6:30 p.m., and the speedway cruise gets underway at 8 p.m. Fireworks will launch at dark and just after drag racing eliminations begin. Exterior parking is free for all fans. Following the fireworks, eliminations in O'Reilly Auto Parts Friday Night Drags Week 8 get underway, as some of the fastest racing in Georgia across 18 different divisions hits the pit lane drag strip in a high-octane battle for a trophy, bragging rights and season championship points. Competing vehicles range from supercharged cars to stock vehicles, daily drivers and even motorcycles and ATVs.